Monarch Air Group provides private air charter in Kauai, HI. Our clients benefit from top-notch service, unrelenting dedication to safety, wide selection of aircraft, and years of experience in chartering private jets. To obtain a free quote, please use our online quoting tool provided below, or call toll free 1-877-281-3051. 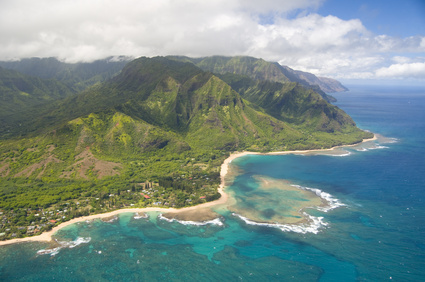 Located in the Pacific Ocean, Kauai is the northwestern most of the main Hawaiian Islands. Kauai is situated northwest of Oahu, across the Kauai Channel, and east of Niihau, across the Kaulakahi Channel. Being the fourth largest island of the state, Kauai is geologically the oldest of the major islands of Hawaii and was Captain James Cook’s first Hawaii landing place in 1778. Named as “The Garden Island” Kauai has splendid natural environment and stunning beauty. Kauai is well known for its tropical rainforests, grand mountains, impressive desert, white sandy beaches, beautiful exotic gardens, and wonderful waterfalls. Kauai has been featured in a number of movies such as “Jurassic Park,” “South Pacific,” and “Raiders of the Lost Ark”. Having fine sunny weather, plenty of sightseeing, Kauai is a tropical island paradise that attracts tourists from all parts of the world. The island offers various outdoor activities including hiking, golfing, scuba diving, kayaking, snorkeling, camping, whale and dolphin-watching cruises, unforgettable helicopter flights and walking tours. The island’s main town and the seat of Kauai County, Lihue is located on Kauai’s southeastern side and is approximately 103 miles (166km) from Honolulu. The main aviation gateway for the island of Kauai is Lihue Airport (LIH).